On Saturday night Madtini was invited out to a special cocktail tasting session with Snapstaff, a Toronto-based group bringing cocktail revivalism to private events. We were joined by Alexa Clark, blogger/author of Cheap Eats Toronto, and organizer of the Secret Pickle Supper Club and Zaigham Zulqernain, of the marketing agency House of Bamboo. Snapstaff began offering their services to the Toronto area back in May, and their mission is to bring crafted cocktails to clients that are tired of the typical sweet drinks that are full of artificial flavours and colours. They specialize in using real ingredients including freshly squeezed juices, bitters, teas, agave, herbs and spices. They will prepare a special menu of drinks for your guests, taking into account the theme, season and and anything else you’d like. We were served up 5 of their featured cocktails. The most difficult decision was which drink to try first. The first drink we tried was the Cumberland, a cool cocktail perfect for a summer patio featuring muddled cucumber, pear nectar, lemon juice, simple syrup and gin. Next up was the Cilantro Mule, featuring fresh lime juice, fresh coriander, ginger-lemongrass cordial, gin, topped with club soda and garnished with a slice of lime and a sprig of coriander. Drink #3 was the Greyhound Deluxe, a mix of fresh-squeezed grapefruit and lime, simple syrup, vodka, cherry bitters and a mint leaf. Things got even more interesting with the last two drinks we sampled. The New Old Fashioned was a strong, sophisticated drink ideal described by Zaigham as perfect for sipping on a cold winter night next to a fire with a good cigar. The drink was made up of sliced pitted cherries, maple syrup, Peychaud’s bitters and bourbon. This drink would set Don Draper back a few steps. 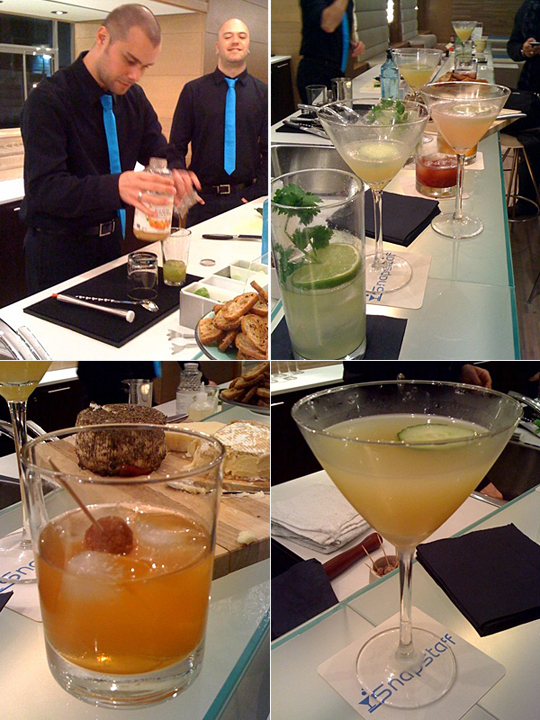 The final drink was the Georgian Jealousy, a complex cocktail based on late 19th century tastes. The drink balanced the aromatics of the gin with tannins, vinegar and honey and then completed the drink with strong tea, apple cider vinegar, honey and gin. It was tough to choose a favorite of this group, but if i had to choose one Snapstaff drink it would be the New Old Fashioned… or the Greyhound Deluxe… or the… Find out for yourself and hire Snapstaff for your next party or event in the Toronto area. Their rates are on the website.